From the time that Nephi drew Laban’s sword from its sheath and slew him with it, the weapon held special significance for the Nephite nation. The Book of Mormon references the sword of Laban on multiple occasions. For instance, Nephi said that in order to protect his people he “did take the sword of Laban, and after the manner of it did make many swords” (2 Nephi 5:14). Jacob noted that Nephi “wielded the sword of Laban in their defence” (Jacob 1:10). Mormon mentioned that King Benjamin “did fight with the strength of his own arm, with the sword of Laban” (Words of Mormon 1:13). And in Mosiah 1:16, we learn that Mosiah received the sword of Laban from King Benjamin. In light of these passages, some may rightfully wonder what was so special about Laban’s sword. In the ancient world—including ancient Israel—swords were often seen as a symbol of authority, kingship, or divine favor. It seems that this is precisely the symbolism that Nephi intended when he described the circumstances under which he obtained Laban’s sword. Each sword was originally wielded by a man of might. Each sword’s owner had his head cut off with his own sword by a faithful youth. Each sword was finely crafted for its time and was unique. Each sword was revered by the people. Each sword was used to lead people. Each sword was a symbol of authority and kingship. It could be added that both swords were included in their respective nations’ national treasuries. The sword of Goliath was kept with the high priestly ephod which was associated with the Urim and Thummim (1 Samuel 21:9). Among the Nephites, the sword of Laban was preserved with the plates of brass, the interpreters, the breastplate, the Liahona, and the Book of Mormon itself (Mosiah 1:16; Doctrine and Covenants 17:1). Noel B. Reynolds has argued that “Nephi carefully constructed what he wrote to convince his own and later generations that the Lord had selected him over his older brothers to be Lehi’s successor. Thus, one interesting way to read the account is as a political tract produced to show that his rule was authoritative.” The way that Nephite kings revered the sword of Laban significantly supports Reynold’s thesis. In Nephi’s narrative, the sword of Laban played a key role in foreshadowing his future kingship and legitimizing his divine calling as a “ruler and a teacher over [his] brethren” (1 Nephi 2:22). The story of his obtaining the sword is loaded with political significance, as well as spiritual symbolism. The sword of Laban symbolized the hand of God in the founding of the Nephite nation and in delivering them from their enemies. In our day, it similarly helps legitimize Joseph Smith’s calling as a prophet and demonstrates God’s hand in the Restoration. Its physical reality—as testified of by the Three Witnesses—supports the historical reality of the Nephite prophets who wrote the Book of Mormon as well as Joseph Smith’s claims about its divine translation. The sword also symbolizes the importance of good leaders. Nephi said he “did take the sword of Laban, and after the manner of it did make many swords” (2 Nephi 5:14). And Jacob, right after mentioning Nephi’s use of Laban’s sword, said that “whoso should reign in his stead were called by the people, second Nephi, third Nephi, and so forth, according to the reigns of the kings” (Jacob 1:11). Just as the sword of Laban was a template for other swords, Nephi was a template for righteous Kings. 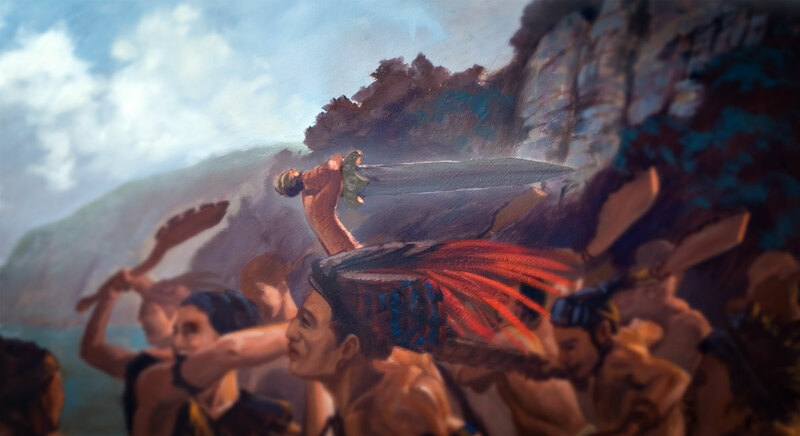 Both Nephi’s name and his sword became inseparably connected to the early Nephite monarchy, each serving as high-quality models for others to follow. Perhaps most importantly, the sword of Laban can help us remember to follow the commandments of the Lord and the whisperings of the Spirit (1 Nephi 4:6). Nephi conquered his enemy and foreshadowed his kingly status by confidently placing his trust in the Lord and diligently following His commandments, even when others wanted to give up and return empty handed (1 Nephi 3:14). Likewise, the sword of Laban is an enduring symbol of God’s willingness to “prepare a way” for each of us to “go and do the things which the Lord hath commanded” (v. 7). Alan Goff, “How Should We Then Read? Reading Mormon Scripture after the Fall,” FARMS Review 21, no. 1 (2009): 137–178. Brett L. Holbrook, “The Sword of Laban as a Symbol of Divine Authority and Kingship,” Journal of Book of Mormon Studies 2, no. 1 (1993): 39–72. For the legal justification of Nephi’s actions, see Book of Mormon Central, “Was Nephi’s Slaying of Laban Legal? (1 Nephi 4:18),” KnoWhy 256 (January 2, 2017); John W. Welch, “Legal Perspectives on the Slaying of Laban,” Journal of Book of Mormon Studies 1, no. 1 (1992): 119–141; John W. Welch and Heidi Harkness Parker, “Better That One Man Perish,” in Pressing Forward with the Book of Mormon: The FARMS Updates of the 1990s, ed. John W. Welch and Melvin J. Thorne (Provo, Utah: FARMS, 1999), 17–18. One of the things that made the sword of Laban valuable is that it was made of the “most precious steel” (1 Nephi 4:9). For evidence that forging high quality steel was known in Nephi’s day, see Book of Mormon Central, “What Was the Sword of Laban Like? (1 Nephi 4:9),” KnoWhy 401 (January 23, 2018). See Brett L. Holbrook, “The Sword of Laban as a Symbol of Divine Authority and Kingship,” Journal of Book of Mormon Studies 2, no. 1 (1993): 39–72; Brett L. Holbrook, “Sword of Laban as a Symbol of Divine Authority,” in Pressing Forward with the Book of Mormon: The FARMS Updates of the 1990s, ed. John W. Welch and Melvin J. Thorne (Provo, UT: FARMS, 1999), 93–96. See Ben McGuire, “Nephi and Goliath: A Case Study of Literary Allusion in the Book of Mormon,” Journal of the Book of Mormon and Other Restoration Scripture 18, no. 1 (2009): 16–31; Val Larsen, “Killing Laban: The Birth of Sovereignty in the Nephite Constitutional Order,” Journal of Book of Mormon Studies 16, no. 1 (2007): 26–41, 84–85; Alan Goff, “How Should We Then Read? Reading Mormon Scripture after the Fall,” FARMS Review 21, no. 1 (2009): 137–178; Ben McGuire, “Nephi and Goliath: A Reappraisal of the Use of the Old Testament in First Nephi,” FairMormon presentation, 2001, online at archive.bookofmormoncentral.org. For the possibility that the sword of Laban was an important relic among the Israelites, see Daniel N. Rolph, “Prophets, Kings, and Swords: The Sword of Laban and Its Possible Pre-Laban Origin,” Journal of Book of Mormon Studies 2, no. 1 (1993): 73–79. These points are adapted from Holbrook, “The Sword of Laban as a Symbol of Divine Authority and Kingship,” 48–53. For the relationship between the Nephite relics and those associated with the Israelite Ark of the Covenant, see Don Bradley, “Piercing the Veil: Temple Worship in the Lost 116 Pages,” FairMormon presentation, 2012, online at archive.bookofmormoncentral.org. It’s possible that the quality steel of Laban’ blade made it more reflective or shiny than other blades. The sword was perhaps kept in a Nephite temple and, if so, its luster may have symbolically represented the “flaming sword which turned every way, to keep the tree of life” (Alma 42:2–3). We know that the brightness of swords was an important concept to the Nephites because when the Anti-Nephi-Lehies buried their swords, they did so “that they may be kept bright, as a testimony that we have never used them, at the last day” (Alma 24:16; emphasis added). Noel B. Reynolds, “Nephi’s Political Testament,” in Rediscovering the Book of Mormon: Insights You May Have Missed Before, ed. John L. Sorenson and Melvin J. Thorne (Salt Lake City, UT: Deseret Book, 1991), 221. See also, Noel B. Reynolds, “The Political Dimension in Nephi’s Small Plates,” BYU Studies Quarterly 27, no. 4 (1987): 15–37. In the ancient world, armor and weapons were expensive, and high quality armaments were often only available to elite soldiers. When one soldier killed another in combat, he was often privileged to take the enemy’s armor and weapons for himself. Not only did this give him greater wealth, but if the enemy’s armaments were superior to his own, it would allow him to become a more powerful warrior. In the ancient mind, this transferal of armor and weapons could also be seen as a symbolic transferal of power. Thus, the armaments of fallen combatants were often more than mere trophies. Paul used a relevant analogy when he spoke of the need to put on the “the whole armour of God” in Ephesians 6:13. By taking upon us God’s spiritual armor, we symbolically obtain His power as well. 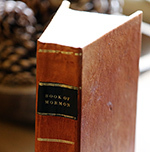 For more information about armor-of-God themes in the Book of Mormon, see Book of Mormon Central, “What Does the Book of Mormon Say about the Armor of God? (2 Nephi 1:23),” KnoWhy 378 (November 2, 2017). The Lord gave these witnesses assurance that they could view of the sword of Laban, along with the other Nephite artifacts, in Doctrine and Covenants 17:1: “Behold, I say unto you, that you must rely upon my word, which if you do with full purpose of heart, you shall have a view of the plates, and also of the breastplate, the sword of Laban, the Urim and Thummim, which were given to the brother of Jared upon the mount, when he talked with the Lord face to face, and the miraculous directors which were given to Lehi while in the wilderness, on the borders of the Red Sea.” Emphasis added. William Pilkington to Vern C. Poulter, 28 February 1930, Special Collections, Harold B. Lee Library, Brigham Young University, Provo, Utah (emphasis added); as cited in Holbrook, “The Sword of Laban as a Symbol of Divine Authority and Kingship,” 62. George Q. Cannon, “Church History,” The Juvenile Instructor 19 (1 April 1884): 107 (emphasis added); as cited in Holbrook, “The Sword of Laban as a Symbol of Divine Authority and Kingship,” 62–63. Many of these textual parallels were derived or adapted from the following articles: Ben McGuire, “Nephi and Goliath: A Case Study of Literary Allusion in the Book of Mormon,” Journal of the Book of Mormon and Other Restoration Scripture 18, no. 1 (2009): 16–31; Alan Goff, “How Should We Then Read? Reading Mormon Scripture after the Fall,” FARMS Review 21, no. 1 (2009): 137–178; Val Larsen, “Killing Laban: The Birth of Sovereignty in the Nephite Constitutional Order,” Journal of Book of Mormon Studies 16, no. 1 (2007): 26–41, 84–85; Brett L. Holbrook, “The Sword of Laban as a Symbol of Divine Authority and Kingship,” Journal of Book of Mormon Studies 2, no. 1 (1993): 39–72; Taylor Halverson, “Nephi is David and Laban is Goliath,” unpublished manuscript, July 3, 2007. That's extremely unlikely. The sword of Laban is described as a steel sword. Steel swords were uncommon in Nephis day, they were unheard of in Davids day. Is it possible that the Sword of Laban was also that very same Goliath's sword that David used?